Save $200 When You Buy a Pair of AIR12’s! A pair of AIR12 Loudspeakers! Now through March 31, 2017 save $200 when you buy a pair of AIR12 Loudspeakers–that’s about $999 for the pair! The AIR12 Loudspeakers are a part of a family of compact and lightweight active loudspeakers aimed at mobile and install applications. They’re easily portable and feature 1,200 watts of Class D/Class AB power with digital tuning functions. 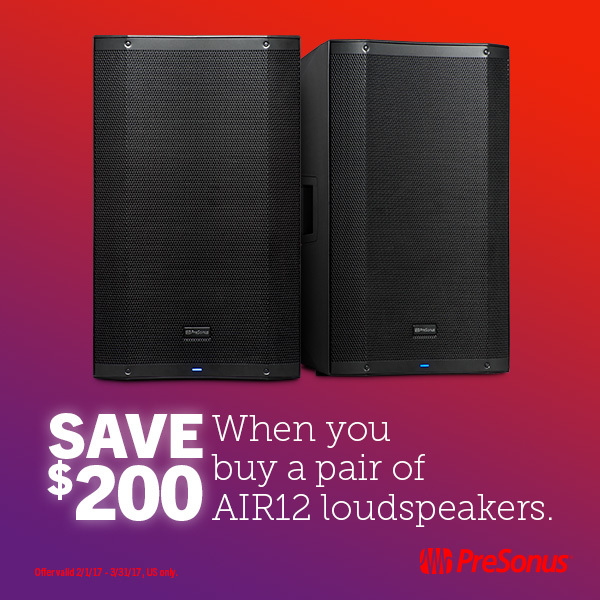 Posted in Live Sound Reinforcement, Promo / Discount | Comments Off on Save $200 When You Buy a Pair of AIR12’s!